Spring is officially here! Start making plans for Round 1! HomeLatest NewsSpring is officially here! Start making plans for Round 1! 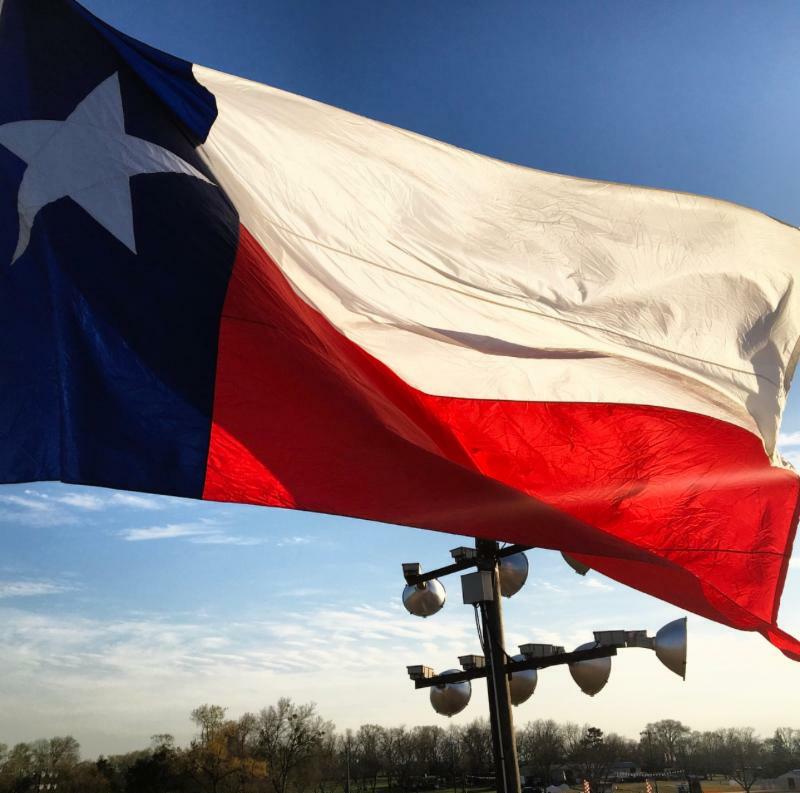 The Texas LONE STAR State Championship MX Series is almost here!! Organized Practice – Open to all! Join us for our FIRST Organized Practice day of the year! It is open to riders of all ages, bikes, and skill levels, and is organized into bike/skill groups for safety. No membership of any kind is needed- just sign up**, get your practice sticker, and ride! This is a great way to get in some seat time before Rounds 1 of BOTH the DAY & NIGHT series’ kick off on this same weekend! The practice fee is $25/rider, but will be prorated throughout the day. So even if you miss the first round of practice, you can still practice in the 2nd, or even just 3rd, round of practice! **All minors under 18 years MUST have a parent present to sign a release to practice or race. Or they must bring a completed NOTARIZED release. You will not be allowed to ride without this. You may print a release HERE. The 11th Annual LONE STAR Night Series will be kicking off Round 1 on Saturday, April 8!! With so many classes offered for riders to race during the cooler evening hours, there are sure to be several for you to choose from! Come and have some fun racing under our bright, stadium-style lights! 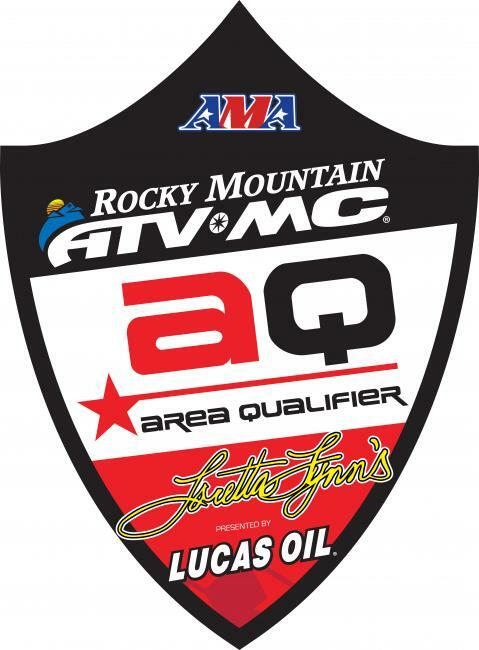 You only need to race in 6 of 9 rounds to be eligible for series OVERALL AWARDS! If you race more than 6 rounds, your best 7 of 9 will count! 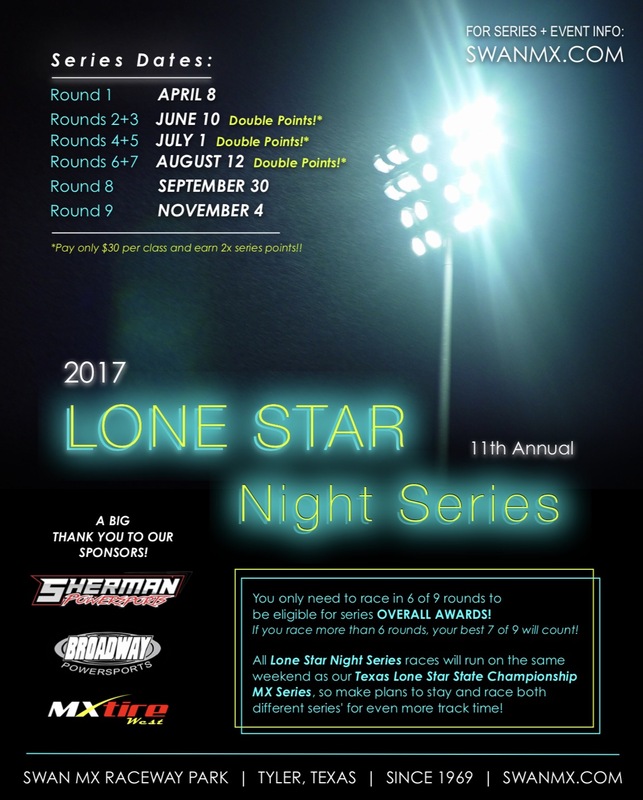 All LONE STAR Night Series races will run on the same weekend as our Texas LONE STAR State Championship MX Series! So make plans to stay and race both different series’ for even more fun and track time! 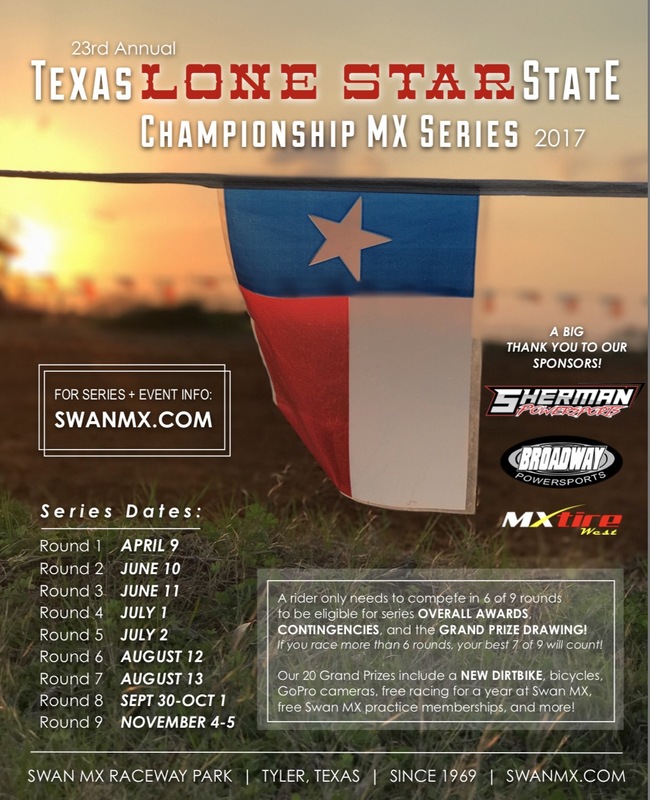 On the following morning, Sunday (April 9), we will be holding Round 1 of the 23rd Annual Texas LONE STAR State Championship MX Series! You only need to compete in 6 of 9 rounds to be eligible for series OVERALL AWARDS, CONTINGENCIES, and the GRAND PRIZE DRAWING! If you race more than 6 rounds, your best 7 of 9 will count! 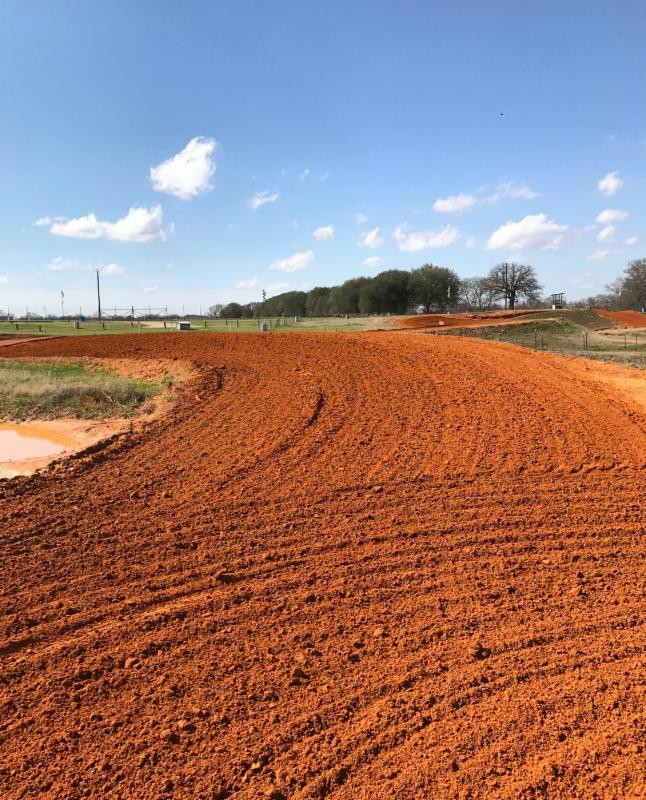 In addition to great overall awards and awesome contingency giveaways at the end of the series, our 20 Grand Prizes include a NEW DIRTBIKE, bicycles, GoPro Cameras, free racing for a year at Swan MX, free Swan MX practice memberships, and more! !